With the competition from Amazon’s Kindle Fire, Google’s Nexus 7, and the soon Microsoft surface tablet, Apple is finding ways to be more competitive in the tablet market. 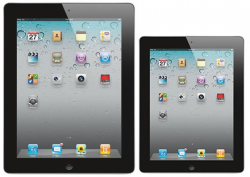 A couple of years ago, Steve Jobs claimed that the iPad was the perfect size and never hinted a miniature iPad. Though that does not to be the case in 2012. Recently, about a week ago, Apple leaked information about the 7 inch iPad to The Wall Street Journal and Bloomberg as Google was opening up the orders for Google’s Nexus 7 tablet. Apple has said that they are working on a 7.85 inch iPad tablet that will cost less than the $499 iPad and to be announced in the next five months. The New York Times has since released some information about the information they got. The report says that the Apple is planning for a smaller tablet is part of a textbook business strategy. Apple strategy is to lure different customers with various sized tablets suited for their needs. It seems that Steve Jobs had some information about the tablet. Rumors are also saying that Apple is also making a 10.1 inch tablet as well. It is doubtful that Apple is making one since no solid evidence that we know of and it may cause fragmentation in the iPad market.